The Honda Civic made its debut in 1973, and has since established a reputation for quality, low cost of ownership, and excellent fuel economy. 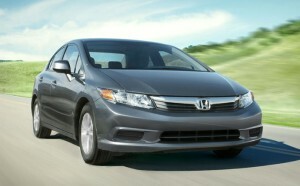 Now in its ninth generation, the Civic recently experienced a refresh for 2013. Now with a more luxurious interior and improved handling, the Civic takes one of the top spots in its class. Take a look at some of the major reasons Michigan City and Merrillville drivers should consider the Civic, whether brand new or pre-owned. The seventh generation of the Honda Civic was sold from 2001 through 2005 as a sedan, coupe, or two-door hatchback. The seventh generation Civic was available in three main trims (DX, LX, and EX) in addition to a couple of specialty trims like the VP, HX, SE, and Hybrid. The eight generation of the Honda Civic lasted from 2006 to 2011. Drivers had the option of a coupe or sedan and new trim levels such as the EX-L, Si, and GX (natural gas). Other than the Civic Si, which made its debut in 2007, all models were outfitted with a 1.8L engine and a five-speed manual transmission. If you are in the Michigan City or Merrillville area, be sure to head over to Bosak Honda in Michigan City to experience the Civic for yourself. Regardless of whether you opt for a new or pre-owned model, you can’t go wrong with the Civic. Take one for a test drive today!